Hello Friends this tutorial is relating to dynamically insert or delete input html fields using Jquery Ajax with PHP MySql. User can insert more than one data at the same time. User can Add bulk data at same time. Data will be inserted with out page refresh because we use ajax function call for insert data. User can add more fields by clicking on add more button then new textbox will be appear on webpage with remove button. 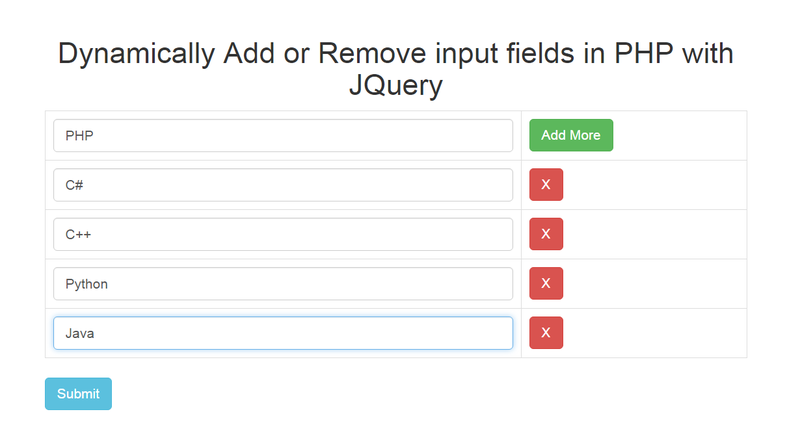 If user want to remove some field then it can be remove input fields on click on remove button. Now a days this functionality is very useful in web application. Useful guide! IS there any official PHP tutorial website for learn the new version of cake PHP. Nice post and really cool info about jquery codings. Very informative post! Thanks for providing us this information. Keep us updated by sharing more such articles.